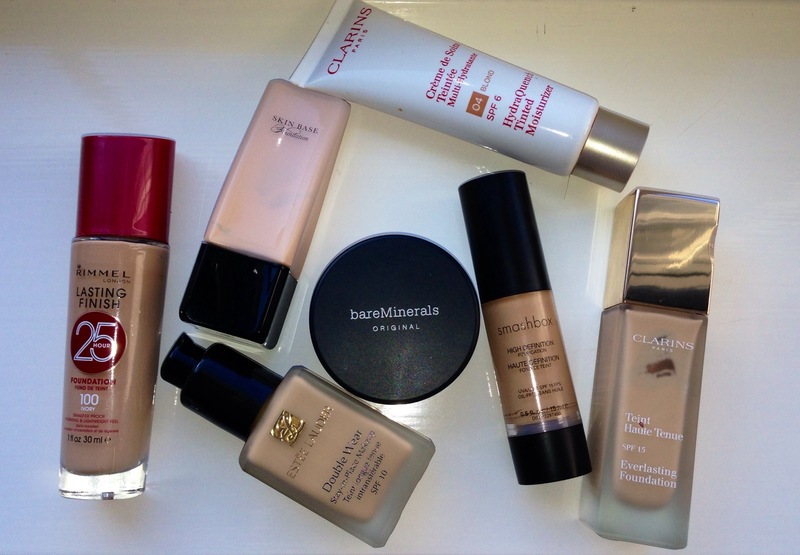 The Starting Off Project: Foundation – The Beauty Spot. As some of you will know I am not uploading these posts in any particular order. I feel I have more to say about foundation than concealer which is why I’m doing this one first. Foundation is one of those products that I think some people define as wearing ‘a lot’ of make up. More often than not, foundation is not mask like and is there to even and enhance the skin. The thing that I have learnt already from writing these posts, is that you need to know what you are looking for. Just looking for any foundation won’t get you the right one, and will often mean you try a large number before finding Mr Right! Like with skincare, if you know what your skin needs and how you want to look, you’re halfway there, especially if you’re going to a department store counter for advice. The consultant on the counter will launch into asking you questions about what finish you want to achieve, how you apply your foundation, what skin type you are, what occasions you will wear the foundation, what textures you like; be prepared to give concise answers to these questions, that way the consultant can confidently recommend the right foundation for you. Personally, I feel it’s worth investing in a high end foundation. I’ve recently purchased my first drugstore foundation since I was 16 and I was baffled! I’ve worked in cosmetics and beauty for 8 years and would say I know my stuff, but the descriptions on drugstore foundations are so hard to translate into the crooks of what you want: light, medium, full coverage/matte, dewy, satin finish. Before staring this post I collected my foundations together, I didn’t realise I had this many as I tend to only reach for two of these regularly. My collection tends to comprise of medium or full coverage foundations with a yellow base. I have some much darker colours and tinted moisturisers that I use to darken my usual shades either during summer or when I have used self tan. For me, coverage always needs to be edging on the full side as I have a lot of red scars at the moment so my foundation needs to cover them. Foundation tends to come in a number of textures: cream, liquid, mousse, mineral powder, compact. Most brands will cater for most skin types within their foundation collection. As a very loose guide, cream or hydrating liquids will be better for a drier skin, and mousse or powder will be slightly better for oily skin. However as many of you will know, it’s the finish that really determines what you will pick. Anything mattifying will be great for oily/combination skins, and something that’s a little more dewy (shiny) is better for a dull or dry complexion. Foundation has come such a long way in recent years that you can get matte foundations that still give the skin a beautiful luminous glow (my all time favourite Clarins Everlasting Foundation has this finish). Don’t forget that you will most likely powder over the top of your foundation, this could be something matte or luminous but will keep your makeup in place during the day. Be careful when choosing powder as well, because some may alter the foundation colour. To stay safe, a loose translucent powder is a good option and applied with a soft powder brush will give a finished look but not ‘cakey’. I’ve started to use my Bare Minerals Mineral Veil again for this purpose. When choosing a shade have in mind what base your skin has. I definitely have a yellow base in my skin, so those foundations sit much better on me. I also tend to match my foundation to my neck or my décolleté. This is because, as mentioned before, I have a lot of red scarring on my face and the rest of my skin is super pale. If I matched to this, I would pretty much look like I’d been dug up. I work in a department store where there are artificial lights everywhere and a shade that is too pale always makes me look ill. If you are testing drugstore foundation but don’t want to go in ‘bare’, try finding another patch of skin that’s similar to your face. This may be your neck, I sometimes use the inside of my wrist as that area doesn’t get much sun so it’s a pretty good match for my non-tanned skin. If you are heading to a beauty counter to get matched, please be serious about what you are asking the consultant to show you. Maybe do some research into a particular foundation before randomly picking a brand to try. Ask to try the foundation on your face, after feeling the texture and seeing the finish on the back of your hand, and maybe wear it for while and take a look in natural light and go back a little later, this is why I say to research the foundation you may want to try. There’s nothing worse than going from counter to counter having half a face done then taken off because you didn’t like it, try and discover if that’s going to be best for you before it’s put all over your face. It is usually possible to ask for a sample, but I’d say that if you get one and you are going to return to purchase, find the consultant who matched you, she/he will really appreciate it! I really feel that foundation is one of the hardest things to buy and there will always be a lot of trial and error with textures and finishes, but once you’ve found that ‘holy grail’ foundation it will be very hard to sway you to try anything else; and heaven forbid the company discontinue it – OMG!!! !